Former Cabinet Minister Zam, now a leading anti-Najib blogger, says "a majority of the people have already developed a negative perception of Najib due to the allegations against 1MDB". Dr Mahathir Mohamad, therefore, is unlikely to cease his attacks against the Prime Minister. Translate: Zam and friends will continue the offensive until Najib Razak steps down or is ousted. Who replaces Najib is a secondary question. But Abang Din came back in silence last night. He's waiting for the right time, they say. 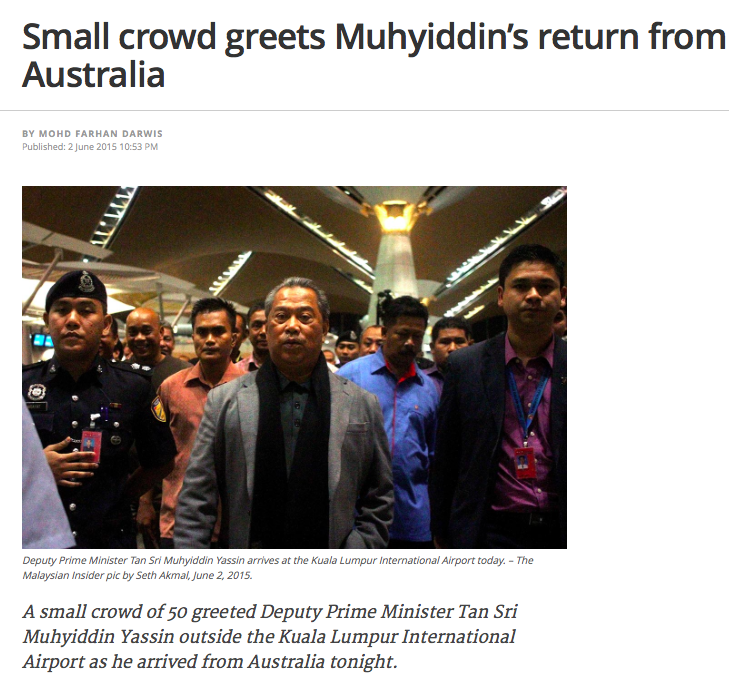 But one observer says the DPM has more sense than some people accord him. "Beliau pun kenal batu api ..."
50 or thousands, the thing is, The SIEGE shall continue. Most people are tired of it already but they don't have a say. Today's Cabinet meeting is most interesting. It will decide if spat turns into full-blown war within UMNO or if common sense would prevail. Whatever happens, I expect PM Najib Razak to make it clear that he will be firm and resolute in dealing with the 1MDB issue, the incessant attacks by his ex boss, and the elements that aim to break up his party and the BN's hold in the next general elections. An Appeal To The PM. Leaders must be clean and must be seen to be clean. That is the perception I think most people have. Here lies the PM's Archilles heel. He has lost the percepion war long ago. He could have played his cards right, after the 12GE, but he blew it big time. He botched it again after the 13GE. Now, I think, it is too late for him to salvage the situation effectively. The damage has been done, and it could prove to be fatal to him and his party if he stays on. Come the 14GE, he and the party he represents will be mauled savagely and mercilessly. If he really loves his party, his people and his country, he should do the decent thing and make the ultimate sacrifice - step down gracefully and make way for his successor to take over the premiership. Please stop this senseless 'war'. There will be too many casualties, innocent or otherwise. Spare this beautiful and blessed country the 'bloodshed'. Please do the right and decent thing, Mr PM. Step down and call it a day. You will be highly appreciated and remembered lovingly for this sacrifice. Ya ya ya rocky. Of course you want to defend your paymaster to still be in power!!! Najib must now begins to understand the feeling of betrayal, what he did to Ku Li in the last minute to support the repugnant, avaricious and the 'chap chong' Mahathir instead. As a consequent of that betrayal the half breed stayed as PM for 22 years and went on not only to destroy Malaysia. He then took the 22 years to grossly abuse his power, he also marginalise the non Malays and thus bred a generation of well known lazy and corruptible civil servants. The entire world knows well what the civil servants are good and famous for. from the moment anyone lands in Malaysia, will get to see and experience these lazy and corrupt custom and immigration officers. These are only a starters no doubt once inside the country anyone will then see and experience the corruptions that is going on in Malaysia. Just take for example the shambles that are going on at the border with Thailand. Who are the people involved and where did they get the audacity to what went on ? They only managed to identify two who are involved in the entire operation the Home Ministry and the police must think the people must be children. Surely an operation of this magnitude must involved more than just two officers. The truth is the entire group of border control officers must know what is going on. Like wise do you think Malaysia is so generous to take care of these refugees, this is just another opportunity for a lot, if not all, of the people involved to enrich themselves. Just how much of the money to take are and feed the refugees are really going to feed the refugees ? What truce? Its big time daylight robbery and mat najib is accountable. What support he is talking about when he lamely gathered only 48% of popular votes in 13th GE! Come on mat najib you are finished! Your Boogie warrior just chickened out from debate with MM. had to send in his gestapo to do his dirty work for him. So much for his warrior blood. Ha! I like how you make it sound as though there is a planned, coordinated, funded, focused group of people which you collectively lump into an 'anti-najib faction'. You got it wrong there. No, these are just normal people, tired of their PM and want to see change. If you insist of calling it a 'faction', then it is a pretty big one already. Get real bro. you hang pimana machai ? and muhydin is the better choice??? 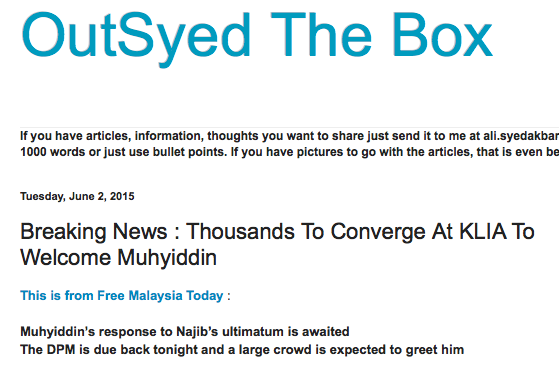 Over 40 hrs since the nothing2hide mess and you still hv nothing to say over something this big? Come on, don't give us the impression that Najib is no more defensible and is beyond saving. All these fightings between the past and the present Umno leaders must be a strain on everybody. It must be very stressful especially on the repugnant, avaricious and the half breed Mahathir's heart. As it is he is having to worry about the conditions of his heart. Now in addition he has to stress it with the problems he is bringing it to himself. He had never allowed anyone to question on the numerous policies he implemented during his time as PM. He has admitted this recently that he would have his ministers sacked when they did not support whatever policies he was implementing. Now he has them remained in the cabinet just to spy on Najib and most of all to create all the turmoils that are giving on. My piece of advise is for him to worry about the conditions of his heart right now. One of legs is already well into the coffin while the other one left is about to step in. Take things easy, you are no longer the man you are, just remember not many people lie up to 100 these days. Consider yourself to be fortunate to live up to 89 all the billions hidden abroad can't buy you the extra years you want. You can demand for many things in life but you can't demand for the extra years you want ! What a bitter and sad life you are having. Mention Mahathir and you froth in your mouth. Pathetic you are indeed. Kenapa confusekan isu 1mdb dengan politik. Kita tahulah ramai tak suka Mahathir. Reading the comments of your readers, don't you understand that 90% of educated folks are anti Kangkung ? Why do you still blog like one of the 10% ? For the money that they pay you ? Or was it a condition of the Latukship they bestowed on you ? Still, I recommend you jump ship before it's too late, and start blogging about reality. Well said! But the current minister does not know anything abt 1mdb and whats really going on......there is no apparent policies at all in this matt bugis administration, its a free for rosmah and wife to do anything they feel fit! Guess Tun is reasonable and infact the rest of amno warlord should follow through! I orang atas pagar datuk. Najib now liability due to his wife. 1mdb. To jilake anon 4.24, since you have so many info about Mahadei wrongdoing why can’t you furnish it to CAGM and hopefully you will strike the first million ok!